Help Save More Lives, give free surgery in Mae Hong Son 2019. Operation Smile is an international non-profit medical charity founded in the U.S. in 1982 by Dr. William Magee and his spouse, Kathy Magee with the aim of providing safe surgeries to underprivileged children and young adults at no cost to address facial deformities such as cleft lip, cleft palate, and burns. The first mission in Thailand was undertaken in 1997 with great support from the former Prime Minister, H.E. Mr. Anand Panyarachun. Operation Smile Thailand provide help to indigent patients in remote rural areas across Thailand. Owing to the tireless devotion of our medical volunteers, non-medical volunteers and our staff, more than 12,000 life-changing treatments were provided. We created long-term sustainability by providing educational opportunities to our in-country medical volunteers. This will benefit the planning of medical treatment for patients with cleft lip and cleft palate as well as patients suffering from burn injuries - another area of our expertise. In February last year (2018), we had 126 patients come on screening day, we able to provided 85 free surgeries for cleft lip and cleft palate children in Mae Hong Son. However, we still have more children whom are in needs for these treatments to bring back their smiles. Our doctors and volunteers are ready all we need are your kind gift and support to make this happen. We are going back! To “Healing Smiles and Changing Lives” again in February 2019. Uses of funds: Provide free surgery for 100 children from 11th – 15th February 2019 at Srisangwan Hospital, Mae Hong Son. Average cost per surgery is 55,000 THB for medical supplies and equipment. 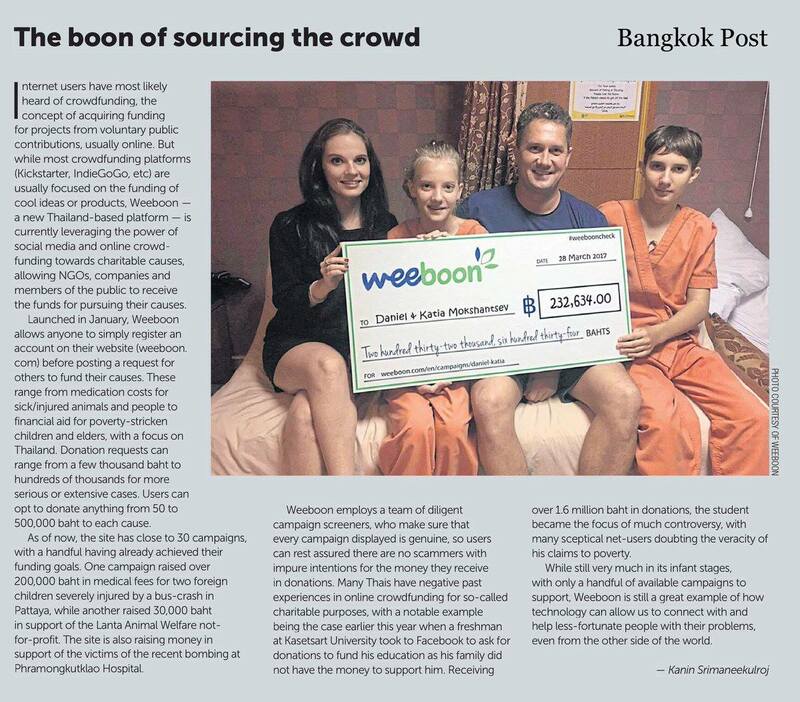 However, we are asking WeeBoon donors to support us in providing 30 treatments (1.65 Million Baht) in this causes. Your gift can change their life, forever! Statistics show that every three minutes, a child is born with a cleft. A child born with a cleft palate often is unable to successfully breastfeed or bottle feed. Children with these deformities can suffer from a multitude of medical problems including difficulty with speech development, hearing difficulties resulting from ear disease and chronic ear infections, and breathing problems followed by complications such as pneumonia. Children born with these deformities often hide away from the world because of the stigma and isolation it brings, their self‐esteem shattered. In Thailand, there are countless numbers of cleft children living their lives untreated.